I believe in the power of having a destination. I showed up to photograph the hot air balloon kick-off to the Green River Festival, in Greenfield, Massachusetts. However, rain delayed the launch. So I headed off for breakfast, consciously choosing to not take the most direct, habitual route. 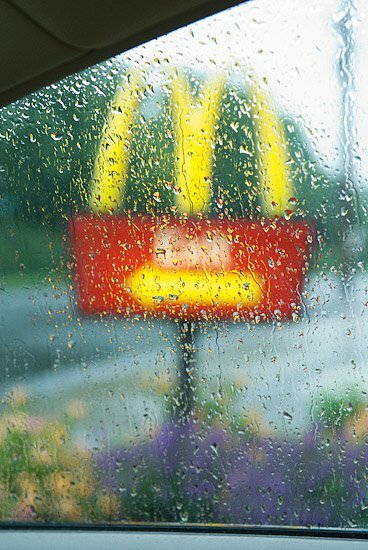 It was really pouring when I passed McDonald's. I had watched the recent grounds makeover of this location and was interested in how the manicured lawn hemmed in by sidewalks and pavement looked non-natural. 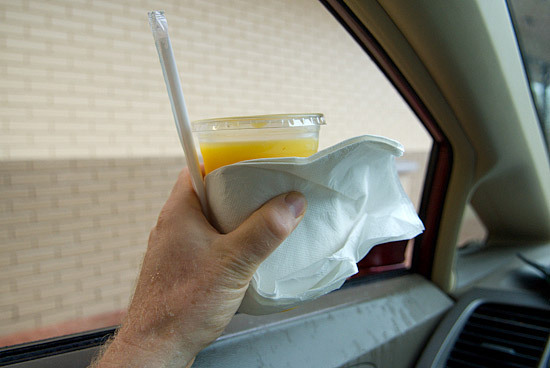 I parked and shot through the drop splattered window, musing how consumers idling in fast food drive-thru chutes symbolize the twin issues of obesity and fuel waste. I then laughed at my judgemental self: Here I am sitting in my car, avoiding getting wet, using fuel, driving around town taking pictures. Maybe I can recommit to the energy saving hypermiling approach to driving. Or, get out the bicycle. Like approaching a ritual in a foreign land, I decided to experience the drive-thru. Since I eat healthy, I ordered a small orange juice. While I waited for my order, I asked the server, Julie, about her Green Wave jacket. I found out that plays on the Greenfield High School basketball team and that the team did not do very well. She is a junior and takes some classes at Greenfield Community College for which she receives both high school and college credit. "You must be smart," I comment. Big smile. "I try to keep my grades up." And she is working at 6:30 Saturday morning! After a delay, she sent me to window 2. I asked this server if I could take a picture. "No, you are not allowed to take pictures here." So I pulled ahead a few feet and documented my catch. Note the quantity of packaging for a small oj. Then off to breakfast at Denny's Pantry, a local joint. 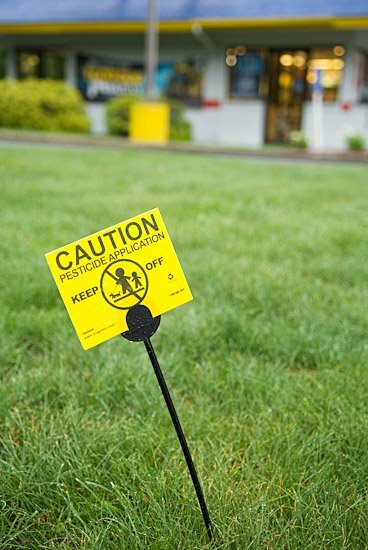 Across the street at Burger King, a uniformed man applied chemicals to lawn weeds. "Can I take your picture?" I asked. His reply was something like: "Sorry, but you can't. Even if 22 News (a local television station) showed up, I am supposed to pack up and leave." 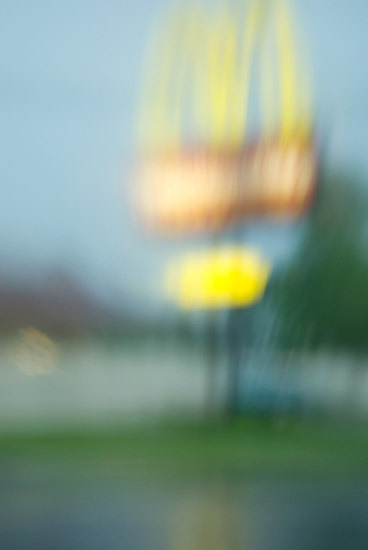 A clean, generic, stock photo. A closer look, with the lens not attached to the camera. I never made it to the balloons, but having a destination led to a powerful experience. 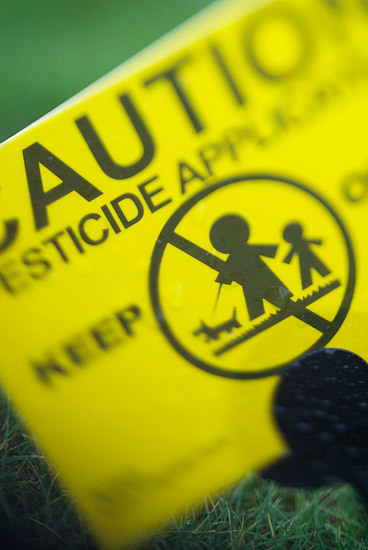 I photographed the pesticide warning signs a few days after my McDonald's visit. 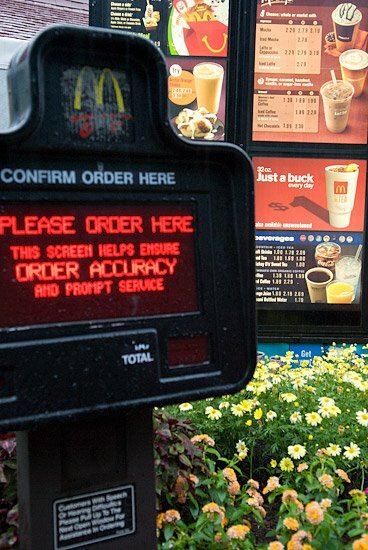 J-Dell gettin' crazy at the drive-thru! Nice one. Thanks! New experiences are a great way to fill the creative well.